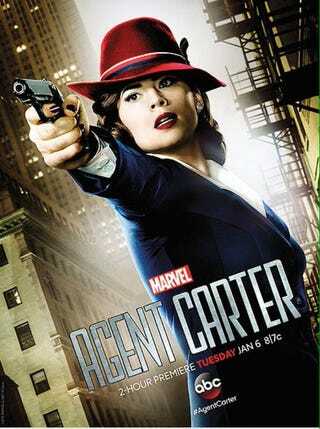 The executive producers of the new Marvel show Agent Carter are Michelle Fazekas and Tara Butters. Tara Butters also happens to be married to Marc Guggenheim, one of the executive producers of the DC show Arrow. When you get them all together, you get one interesting and hilarious interview. Highlights include: Fazekas and Butters saying how much easier it is to write just eight episode mini-series than it is to write a potentially 22-episode season; Fazekas explaining how if they get a name wrong, they have to put money in the "StarkJar" (and Guggenheim explaining that they do the same with people who confuse Roy Harper with Ray Palmer); Guggenheim asking if they were willing to do a crossover with Arrow and how that would go (there is a reference to the X-Files/Picket Fences crossover that never was); and who Tara loves more, her husband or Michelle (her husband, but Michelle is No. 1 on her iPhone favorites list).